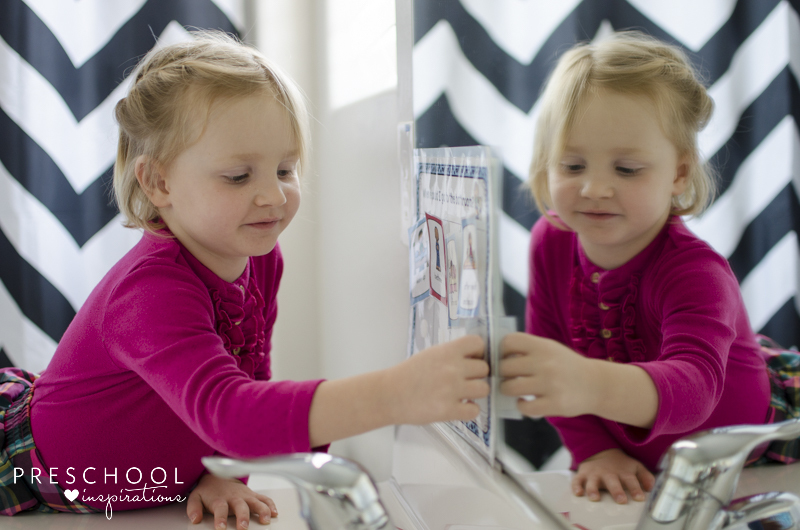 Learn how to get kids excited for potty training using a potty training chart and visual schedule, along with some potty training tips from a veteran preschool teacher and mom of three! Potty training is like a roller coaster. There are the moments of victory, and then we are all holding on for our lives trying to make it to the next success. There is a whirlwind of emotions – excitement, frustration, being on the edge of our seat, and wanting to throw in the towel. Why is it that some children make potty training look so easy? And how come other children make it feel like it will never ever happen? But now with 15 years of potty training experience under my belt, I’ve figured out how to work smarter, not harder when it comes to potty training. 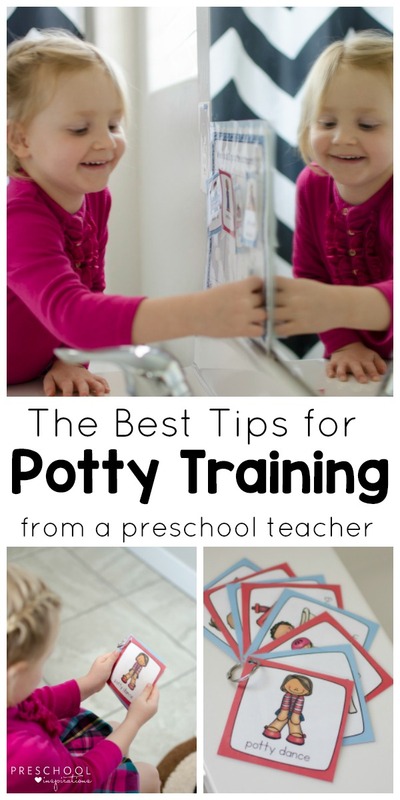 And I’m giving you some of my best potty training tips that have stood the test of time while helping potty train hundreds of children. In addition to being a perfect part of your preschool routine, these are also the methods I used with my own children! I know, I’ve spent a huge chunk of my life in the bathroom. More time than I ever imagined. But what I’ve learned along the way has made it so that potty training isn’t stress-filled or causes power struggles. Coming up with a schedule for potty training can be one of the hardest parts. Especially at the beginning. We all need an extra dose of patience for those beginning moments when the pee finally makes it into the toilet. You might think I’ll tell you to load the kids up on juice and fill them up with salty snacks. Or to go cold turkey and just take the diaper away. Maybe you’re wondering if I’ll suggest sending a child to the toilet every half hour. But I actually tried all of those methods, and I have learned that for many children they just don’t work. Lots of times they lead to huge power struggles or a battle of the wills. Or they cause lots of unnecessary stress and frustration. And trust me, when it comes to potty training, we want to be the calm and encouraging adults. Not the stressed-out adult at the end of our rope. I’ve been there. It’s not pretty or helpful. The truth is that we want children to go to the bathroom when their body tells them, not just when we tell them. 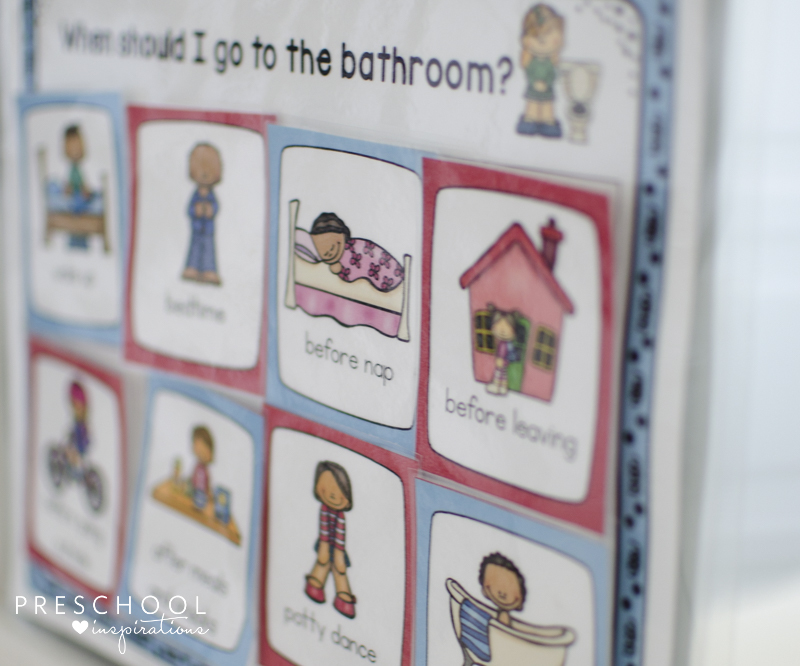 Instead of looking at potty training through the lens of a schedule, adopt it as a routine. Don’t worry, I’ll share more about what that looks like. I’ve seen a number of intense and grueling toilet training methods, but there are more gentle, stress-free ways to approach this. You know your child’s personality the best. My own goal is to teach children full independence and to teach them in a way that prevents accidents and regression. There are a lot of kids who need a little warming up when it comes to using the potty. I spent years having kids sit on little potties for long periods of time, and you wanna know the truth? I regret it. I know now more intentional methods that don’t require days of sitting in the bathroom. I prefer a more scientific approach that works in connection with our own biology and physiology. It just makes sense to use science while potty training in my opinion. Instead of teaching children to rely on us to tell them to use the bathroom, children have the most success when they learn to carefully and diligently listen to their own bodies and follow the natural biological process for using the bathroom. We don’t actually know how full a child’s bladder is generally… unless they’ve been holding their bladder a long time. So we are teaching them to pay attention to the sensation they get when their brains tell them they need to go to the bathroom. A skill that is easier said than done initially since they are used to going whenever. When the focus is on the routine, it helps prevent power struggles and battles of the will. Instead, it helps children build healthy life-long habits and life skills. One of the best ways to help children get into a new routine is with a visual. When my youngest daughter started potty training this past year, I made her a potty training chart template that is also a visual schedule. I tied it in with the connection of routines so that she would use the visual schedule to help remind her when we go to the bathroom each day. As a preschool educator, I know that one of the best ways to help children learn new skills is to break it down for them, step by step. Using photos or pictures makes this even more effective. When I first did this, I figured that the worst case scenario was that we had cute potty training cards around. But I quickly learned that it was really becoming a tool to help her understand potty training and to make it a part of her daily routine. And best of all, it got her super excited. Now she’s been fully potty trained for six months, and I don’t go a week without hearing about her potty training chart. She still loves it! And we keep it along with the potty training book and potty training routine cards in her bathroom drawer so that she can pull them out anytime. 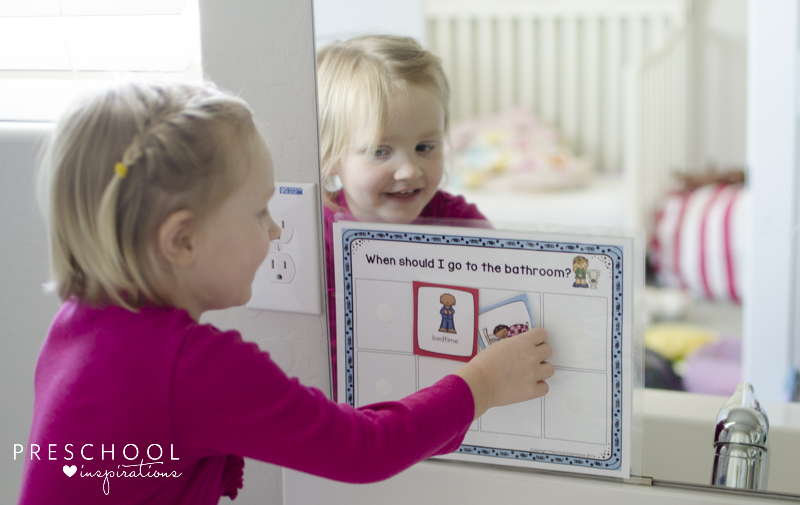 I put her potty training chart printable on the mirror in her bathroom so she could see it each time she was in there. I laminated the potty training chart and visual schedule (available in my store or on TPT) with my Scotch laminator and attached it to the mirror with glue dots. Then I put velcro dots on the back of each of the cards as well as on the potty training mat to make it so that she could attach the cards to the mat. Don’t make my mistake. I should have put all the soft halves on the mat, but I accidentally switched one. So now the bedtime card has to go in the same place every time because it won’t fit on any of the other slots. Overall, it doesn’t matter if you put all the soft halves on the mat or the “scratchy” ones. Just be sure that it’s consistent so you can move them around easier. The cards can be completely used on their own too, without the card mat. You could print them out and put them in an envelope and set them out that way instead. Talk about the time of day it is with your child. 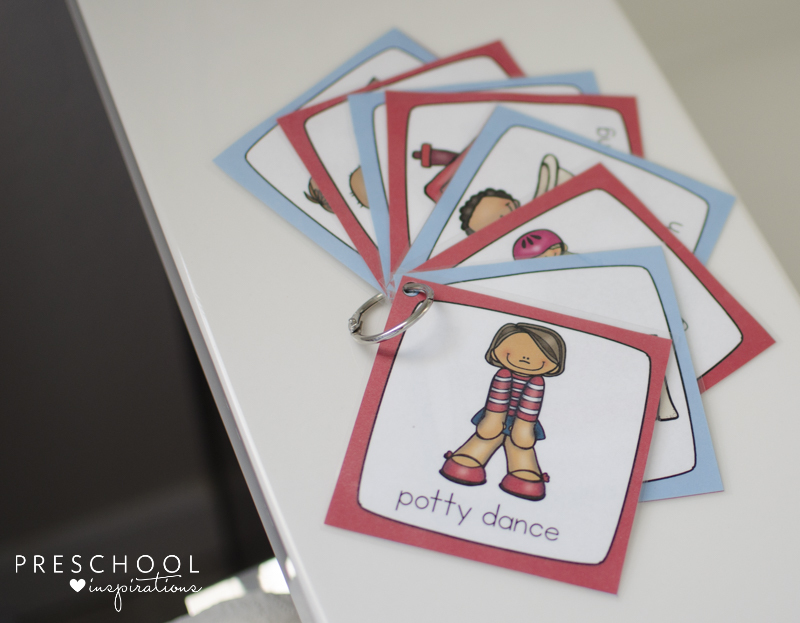 “You just woke up and now your body needs to go potty.” Point to the potty training card that matches or put it on the mat and encourage your child to sit on the potty. I began by reading the potty training book to my daughter (included with the potty training chart) to help open up the discussion about when to use the bathroom. We talked about the times our bodies should use the bathroom and how much better we feel afterward. I would encourage her to sit on the toilet a few times a day. When I would use the bathroom, I would tell her about the steps and talk through them. We sang and watched potty training songs. She watched her siblings use the bathroom. And when she went potty, I would give her a small treat (sticker, small candy, etc). This was short term, and she no longer asked for treats about a month into it. After about two months, she was fully potty trained at around two-and-a-half years old. Once I could tell that it had “clicked” – she understood when she actually needed to go to the bathroom and she was actually going – consistency became key. I had to make an effort to stop everything to go help her when she needed to go. That’s definitely easier said than done. Every child is completely different. Some children pick up potty training right away. Others take lots of consistency. And some potty train much later than others. In some cases, there is a biological or medical reason that a child is struggling such as constipation or sensory issues. If you have questions or concerns about your child’s progress, I recommend speaking with your child’s pediatrician.